“We just returned from a beautiful Iberian Peninsula Cruise. Mirjam Versteegh helped arrange a walking/rolling tour for us in Amsterdam that was excellent. 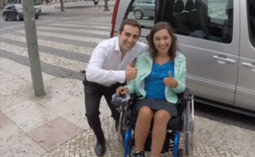 She also arranged a driving tour in Lisbon. Our last stop in Barcelona she arranged our transfer from the ship to hotel and then airport. While in Barcelona she arranged a half day walking/rolling tour and also another driving tour the next day. Everything went perfectly! These private guided tours provided us an opportunity to see so much in a short time! All the tour guides were extremely informative and so interesting. They truly impacted our trip in a very positive way.